As part of its strategy of expansion and growth in the international market, Olmar has just confirmed the sale of a new glass lamination autoclave in Australia. This time, the client is an important international group dedicated to the manufacture of different elements for the automotive sector, and which is now starting the development of a new line of products within the laminated glass sector. 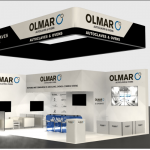 The Olmar autoclave, which will be part of its new facilities, will be ready to laminate Jumbo glasses (3210×6000 mm) and perform Heat Soak Test cycles, which drastically reduce the chances of glass breakage.